A lot of Tasmanian artist Brigita Ozolins' work revolves around words, language and books. Last year, her art installation The Reading Room was on show at the Tasmanian Museum and Art Gallery. 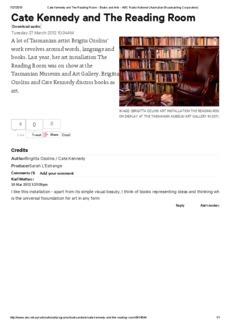 Brigitta Ozolins and Cate Kennedy discuss books as art.